All transactions are safe and secure with a reliable history in online purchasing behind each of our associates. 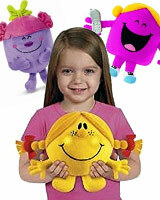 Buy the Little Miss Plush Toys to own Little Miss clothing and merchandise. With these Little Miss plush dolls, the delightful characters leap from the pages of the Roger Hargreaves books right into your living room. Collect characters like the Little Miss Naughty doll, whose mischievous ways keep her in hot water, or opt for the Miss Chatterbox plush, who carries two cell phones she talks so much. Of course, the talking Little Miss Sunshine plush doll is the most popular toy of them all. In addition to the Little Miss Plush Toys above, browse the Little Miss Clothing Gallery for more apparel like men's and women's clothes, kids shirts or hoodies.